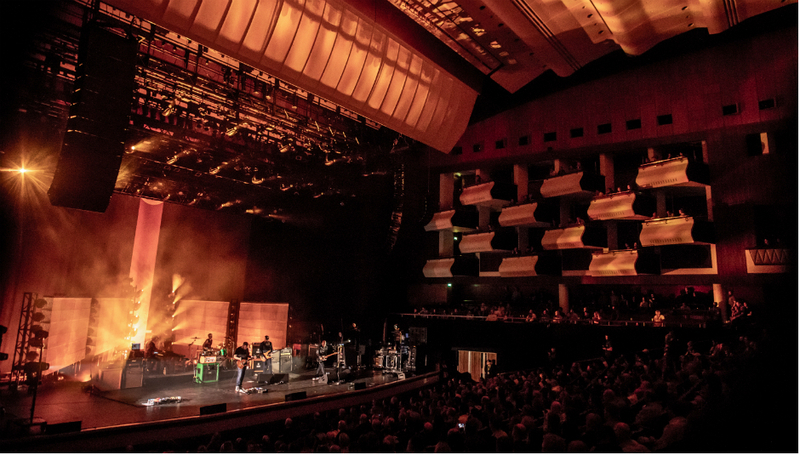 As with many of the acts on this year’s blistering Meltdown festival bill, you get the sense that being handpicked by Cure frontman Robert Smith to perform at Royal Festival Hall on London’s Southbank is something of a dream come true for Mogwai. The Cure are, of course, a huge influence on Stuart Braithwaite’s Glaswegian post-rockers – evident in the tense and bleak atmospheres the band have conjured ever since their 1996 debut, Young Team: "I was definitely a bit of a goth, and still am at heart, I just have no hair to dye black any more", Braithwaite memorably quipped a few years back. Sandwiched between performances by Deftones and Nine Inch Nails, Mogwai are here with a set drawn from across their back catalogue - in a programme boasting the cream of post-rock talent (65daysofstatic and MONO among them), Mogwai are the kings of the hill; top of the heap. For an act whose focus is musical layering, dynamic interplay, and symphony-esque movement-based structures, it’s an apt venue - with its modernist splendour usually home to orchestras, tonight Royal Festival Hall sees a troupe of five make more noise than a pit of one hundred could ever hope to muster. Indeed, they make a jumbo jet sound like a farting mouse in comparison. Mogwai have long been capable of moments of astonishing sonic ultra-violence, and those here for a bout of cochlea-bashing aren’t disappointed - a blistering rendition of ‘Old Poisons’ from latest release Every Country’s Sun sees guitars screeching and touring drummer Cat Myers relentlessly bludgeon her kit to the delight of those in the stalls, who clamber to their feet in appreciation. Similarly fierce is the rumbling bass bombast of 'My Father My King', with its searing eastern-tinged melody ratcheting the tension up and up over the course of its 15-minute duration. There are quieter moments too though, and cheers greet the Slint-inspired spider guitar intro to early cut 'Take Me Somewhere Nice', one of the few tracks here to feature vocals from frontman Braithwaite, breathily crooning into the microphone from behind an uber-cool Fender Jazzmaster. Recent single 'Coolverine' also ploughs a calmer furrow – its icy tremolo melodies shimmering over jagged staccato percussion. Veterans of numerous soundtracks, Mogwai have long had a flair for the cinematic. And if there’s any justice, ‘Don’t Believe the Fife’ will pop up on screen sooner rather than later – its eerie robotic lilt harking back to big and small screen moments from Zidane, Les Revenants and Atomic. Disappearing off stage to a standing ovation at the evening’s close, Mogwai remain a cut above. Just Like Heaven indeed.